We had a review of Kamata-town walking which held on the Premium Friday in the midsummer, when the town flourishes the most. How was the impression of night in Kamata? 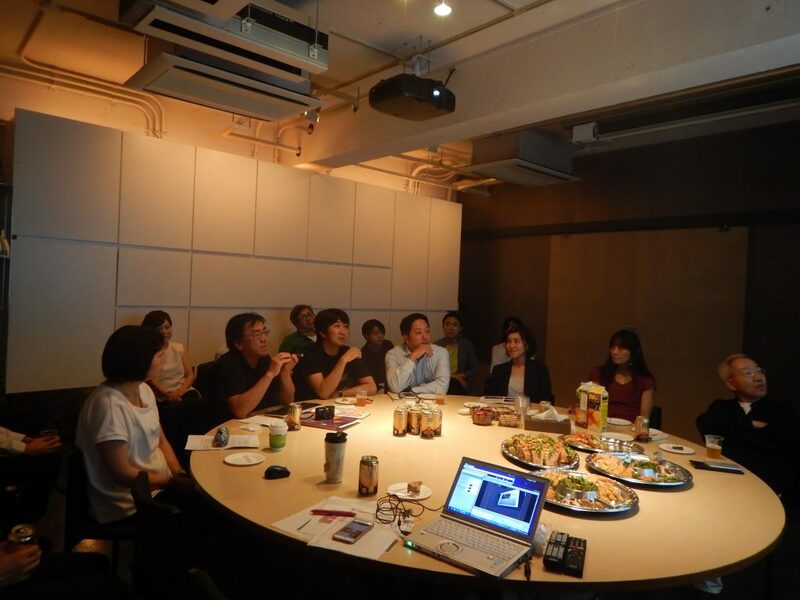 Discussion was carried out with 18 participants. Group leader presented the summary of the walk. Many opinions came from the first participants as well. Slide comparing the streets around the west exit of the station. Eatery with Showa feeling was unanimously selected as a hero. 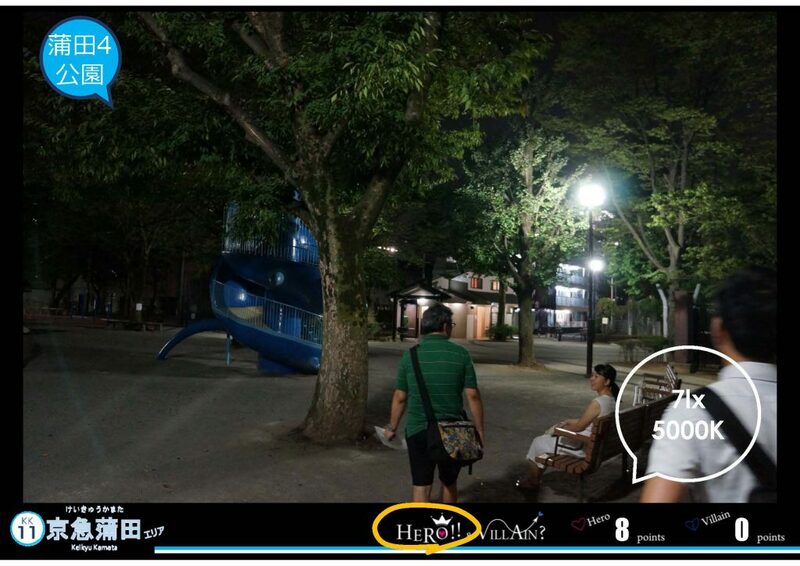 Every member in the group thought the park in the residential area was a hero. 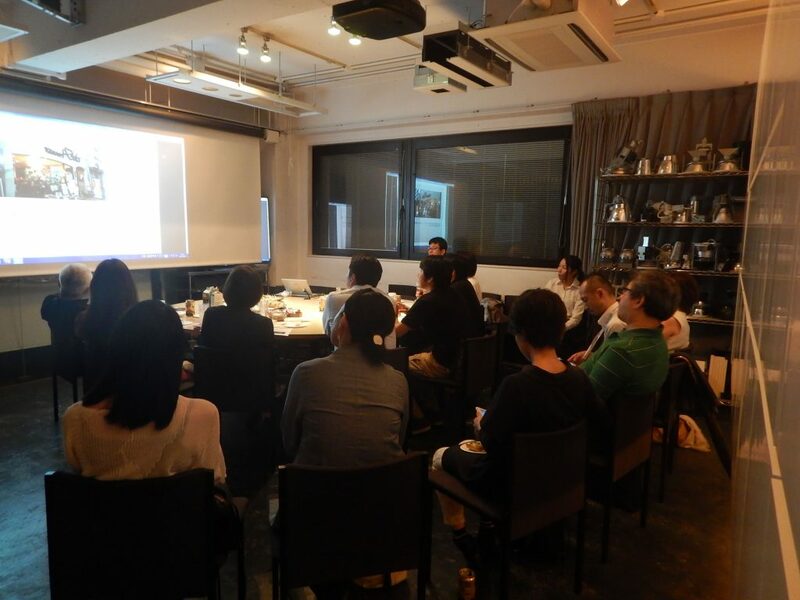 When I asked participants about the impression of Kamata, there were opinions saying “A place that doesn’t bother to go, and hasn’t been explored yet”, “There are many Pachislot and Pachinko stores jumbling around, but doesn’t have bold flashiness like Kabukicho”, “Very convenient for being able to use 4 lines”, “Yuzawaya”. How did these change or didn’t change after the walking? The characteristic of Kamata mentioned in the salon was “active town that is very lived-in feel and prospers with many people at night.” I didn’t see lightings with unified design, but many of the lightings that coming out from restaurants and stores were attractive and called out for a long way, which was not uncomfortable at all. 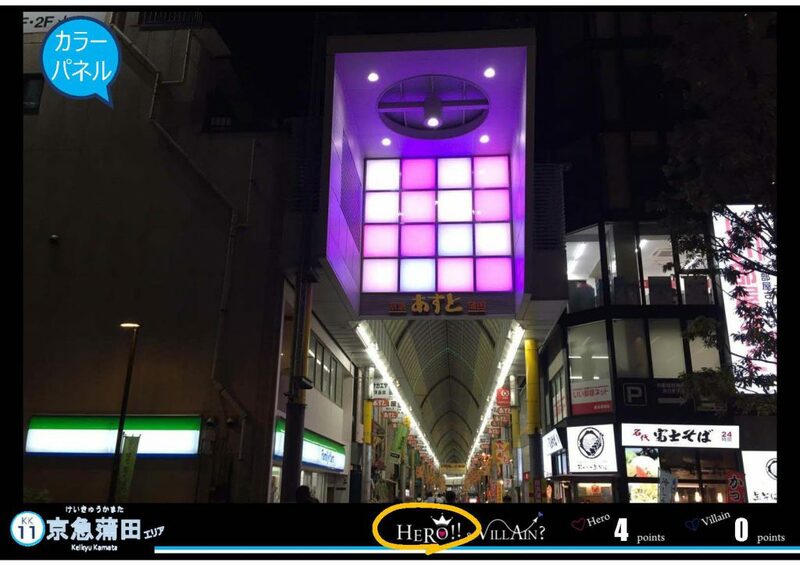 The lighting mentioned as Villain of light was the doorway that has gloomy impression with the darkness of the station entrance, advertisement of station building not being lit up, and street lights and standing advertisements that was not considered for the glare and color temperatures. Warm light leaking out from each stores were mentioned as a hero. The residential area continued from around west exit to the back, and its impression was dark, opposite to the downtown. 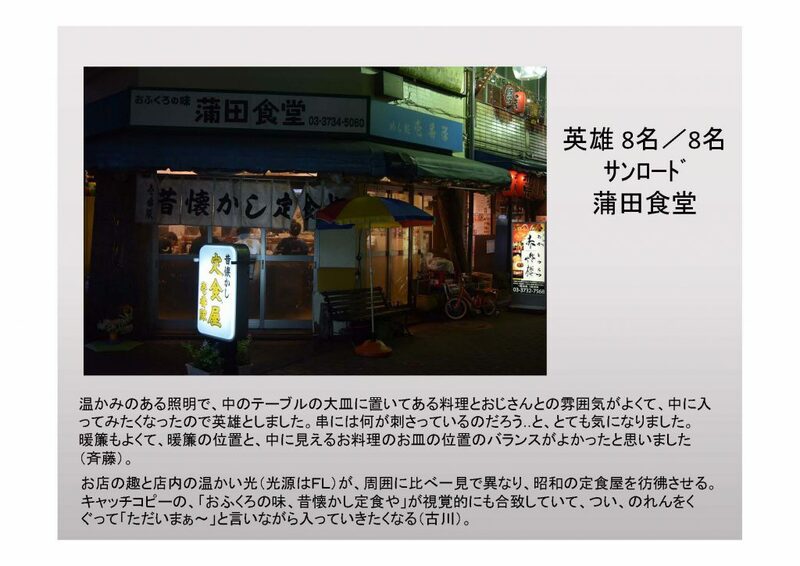 The restaurants existing in this darkness were getting evaluated for being lit lamp of the town. JR east exit is the town with many elements such as shopping street, public culture facility, and Pachislot town. Re-development of the town has progressed, and many saw the town attempting to get improved. Since LED lighting is used instead of conventional lighting fixture, it is very shiny and gives white and cool impression. There was an opinion saying that luminance level and color temperature need to be considered when we use LED. Pachislot place usually tends to be judged as Villain, but there weren’t so much flashy ones in Kamata and many of them got a good impression. Residential area had apartments with lightings that were unified in lower color temperature which gave luxurious feeling, and it made many people want to live there. 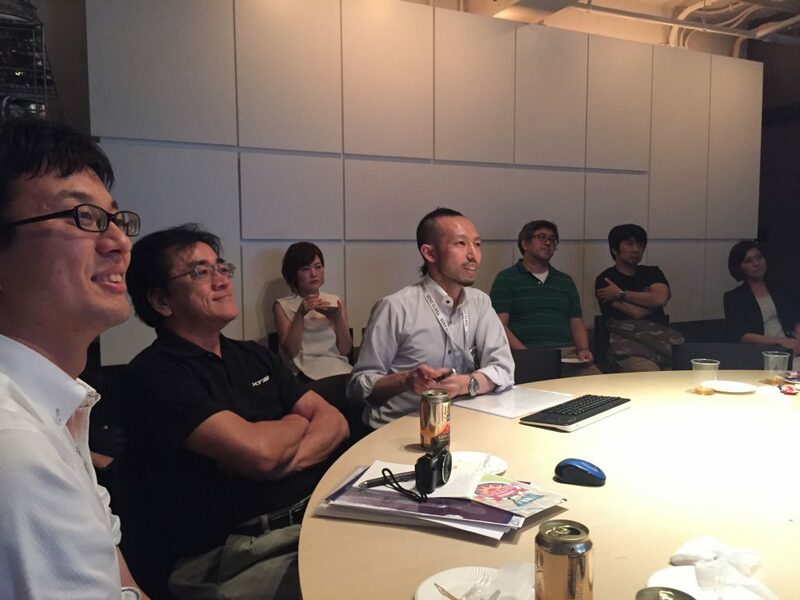 Since Kamata had clear assignment, high expectation was heard such as, “its bad point can be improved soon”, “Kamata has high potential.” There was an opinion saying that unevenness and miscellaneousness creates attracting night of Kamata. I felt more people got good impression of the town after the walk than before. Unexpected things were picked as Heroes in Kamata’s nigh twalk. 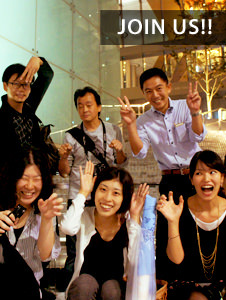 “Hakone” Walking Tour / Nihonbashi & Sumidagawa Survey, plus more. 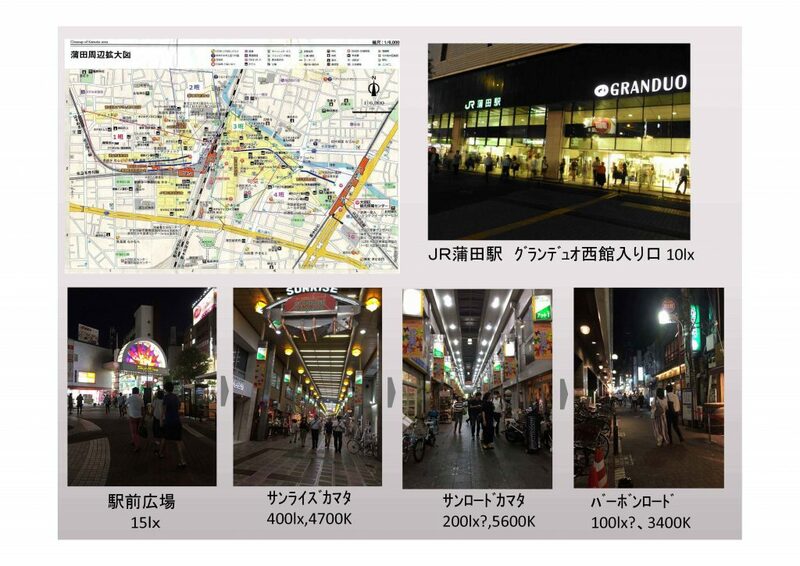 “Toyosu” Walking Tour / Lighting Survey – Shinjyuku, Sendai / Ginza Streetlight Competition, and more.